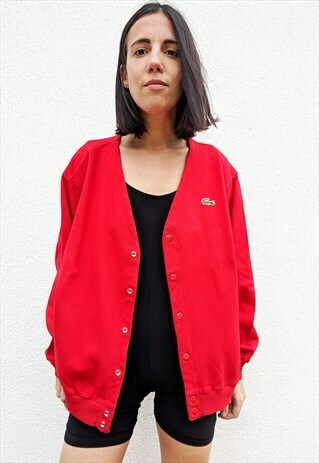 Vintage cardigan Chemise Lacoste with popper button. Amazing vintage condition. Size on label 5. 100% cotton. Made in France. Modelled by Roberta who is size 8/10 uk and 5ft 8 tall. Todays sizing often differs from vintage garments, so please check carefully the Sizing & Care tab above for full measurements of the garment. All items are authentic vintage gems and are one offs, some sign of wear and age are to be expected! Follow our boutique on Instagram and Twitter as new items are added daily. Any question? drop us an message! Model is size 8/10 uk and 5ft 8 tall. Size on label 5 (L). exact measurements are: pit to pit 24", length 25.2"